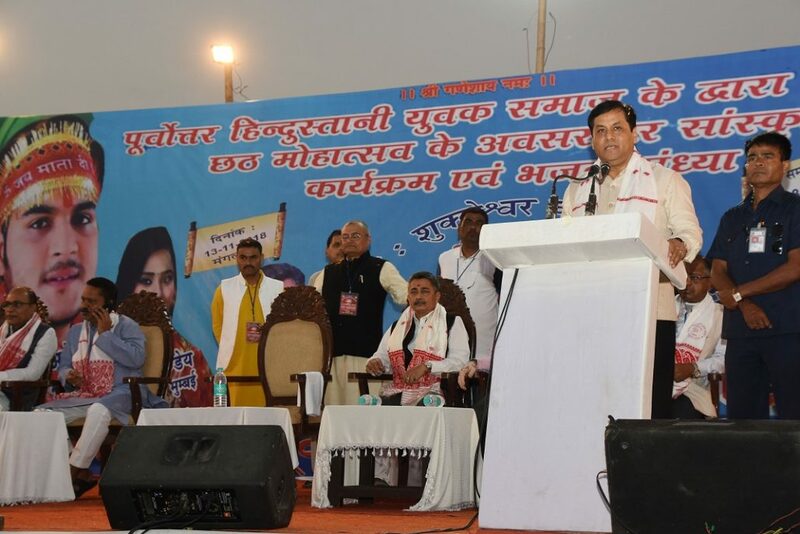 Assam Chief Minister Sarbananda Sonowal said that Assam is a microcosm of great Indian nation where people from different communities have been living in harmony and all of them are working in unison to make the state even stronger and greater. Speaking as the chief guest in the Chhath Mahotsav organized by Purbottar Hindusthani Yuvak Samaj at Kachomari ghat in Fancy Bazaar of Guwahati, Chief Minister Sonowal said that with the unified contribution of everybody, irrespective of all caste, creed, community and religion people are living peacefully in Assam since ages and the co-existence of everybody has made the land enriched and strong. Referring to Prime Minister Narendra Modi’s keen interests for the development of the Northeast, especially Assam, Sonowal said that the State is rich in natural resources and human resources as the State Government with the help from all has been putting in resolute actions for the all-round development of the State. Greeting everybody on the occasion of Chhath Mahotsav, Chief Minister Sonowal said that on the holy occasion of Chhath Puja, ‘let us all take a pledge to live more harmoniously and work unitedly to expedite the development of all’.